Ashoka’s Youth Venture® activates youth as changemakers by working with educators, schools, parents, and companies to create an environment where young people can lead and practice the four core ‘changemaker skills’: Empathy, Collaborative Leadership, Fluid Team of Teams Culture, and Changemaking. In a world of constant change, how will your home, school, community, or workplace adapt if outdated approaches continue to determine how young people grow-up; how they demonstrate leadership; and how they pursue solutions to the problems around them? What if today’s organizations and institutions--which are meant to value youth--continue to hire new talent and recruit students based on status quo criteria, out of sync with our current world of constant change? At Ashoka Youth Venture, we know that in order for young people to succeed in today’s world of accelerating change, they must have experiences to practice empathy, lead collaboratively, and organize in a "team of teams" culture to actualize creative solutions to the challenges around them. To be able to thrive in the world of constant change we now live in, young people need opportunities to dream, lead, and initiate change in and out of school, applying it across all aspects of their lives. A Youth Venture changemaker is any young person who demonstrates the core skills of changemaking while incubating an idea, taking initiative, and cultivating positive change through collaboration. Ashoka started Youth Venture in 1996 by identifying a key insight from seasoned social entrepreneurs within the Ashoka Fellowship. One of the most effective ways to improve our communities and the lives of young people is to put youth in charge. We strive to create opportunities for youth that unlock their creative ideas; cultivate spaces for empathy, leadership, teamwork and changemaking; and realize positive change for the many, not the few. Youth Venture is a global network and dynamic program that creates both a supply and demand for young changemakers by working with youth influencers and ecosystem partners to foster disruptive experiences and tools for catalyzing an “Everyone a Changemaker’ world. Nearly 400,000 changemakers in countries across every region of the world belong to ashoka's global youth venture community. Our Ashoka Youth staff have decades of leadership in the field of social entrepreneurship and youth engagement programs. They work with leaders and teams of changemakers across our networks to activate and multiply spaces for young people to master changemaker skills. The work of our community members fuels a shift in global mindset in order to promote youth-led changemaking where young people innovate, lead, form teams and make impact. Our Youth Venture country teams design holistic strategies and experiential youth engagements that integrate changemaking into the cultures of companies, schools/universities, and youth organizations. We work with partners to co-create tools and programs that enable young people to self-identify as changemakers and master critical pathways for thriving as changemakers. Ashoka’s Youth Fellowship [*In development]: Ashoka’s Youth Venture teams are working with Ashoka Fellows and partners around the world to search for and select young people who have launched projects that have a social benefit, a strong sense of the Everyone a Changemaker vision, and are active peer influencers, inspiring and leading the changemaker revolution. Your Kids [In development] works with corporations to foster employee/parent support for their kids becoming changemakers. Simultaneously, this initiative helps to build a changemaker culture within these corporations. The Your Kids program can also be used with teachers to help their students become changemakers, or with other citizen sector organizations to help their organizations help young people become changemakers. Co-creation sessions for school districts and teacher networks establish an interactive process where Youth Venture co-designs—with education partners and student leaders—ways to build a culture of changemaking within schools. “Dream It. Do it.” is an experiential process where young people discover their inner changemaker and work in teams to launch social ventures that benefit their community. Parenting Changemakers engages parents in a co-creative process aimed at building a changemaker environment with their kids at home. Youth Venture plays a critical role in realizing Ashoka's vision of an “Everyone a Changemaker” world. Young people who know they are changemakers have the ability to innovate and solve problems that change the world around them. Storytelling Innovation for Changemakers is both a professional development tool for staff of organizations and companies, and a youth engagement program for teachers and young people. Ashoka's Youth Venture utilizes the process of storytelling as a vehicle to distribute peer to peer healing, changemaker skills, and to ignite youth-led community building. Our program syncs personal social and emotional development with workforce skills development and creative enterprise for social good that puts empathy to action. The Global Youth Advisory Council brings together leading young changemakers and social entrepreneurs to combine skill-sets for launching their own national changemaker campaigns/actions, and the Council provides strategic guidance to Ashoka Youth Years teams by co-creating youth interventions, and co-leading Ashoka events with allies and stakeholders. Peer-to peer learning and activation for young people to be changemakers through our Changemaker Societies, or, serving on our Global Youth Advisory Council. Connect with the Youth Venture team and get more information here. Impact for youth changemaking is not solely determined by one project for social innovation or one story. We ambitiously define successful impact as mind-set shifts at scale where social behaviors change. Our theory of youth changemaking is guided by whether or not a young person individually, school-wide, or other youth community-wide knows they are changemakers. This is necessary for stepping towards Ashoka’s vision of an “Everyone a Changemaker” world. 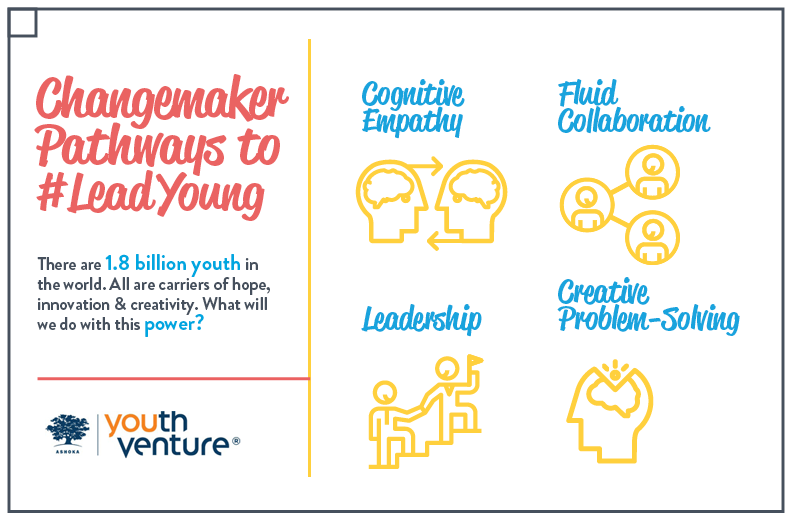 What proportion of 12-year-olds or 15-year-olds know that they are changemakers? What percentages of the stakeholders in a school (or other youth community) know that they have a successful or failing community depending on whether or not it is an “Everyone a Changemaker” culture?